Western Washington University | Help WWU Students do Big Data Science! Help WWU Students do Big Data Science! We need your help purchasing a high-powered server so our students can take their research skills to the next level. If we can raise $10,000 by December 31st, the Biology Department will contribute matching funds (up to $10,000) so we can offer new classes and research opportunities for students and faculty to work with Big Data. This server will provide a teaching specific resource to help integrate computational skill development into current courses and increase student access to new courses that focus on bioinformatics, computational biology and analyses of large-scale genomic datasets. In doing so, we will be able to provide students with a strong foundation in Biology and training them with the technical and computational skills necessary to be competitive candidates in a technology driven job market! Western’s focus on undergraduate education and its recent growth in faculty with training in bioinformatics and computational data science position us well to offer our students the hands-on training they need to participate in the growing bioinformatics workforce. We are adding new bioinformatics-related courses and need help purchasing the computing resources required to support these courses. This will be phase I of a strategic plan for expanding scientific computing in the College of Science & Engineering in the coming years. How will my gift make an impact? You will help students develop computational and data skills necessary to analyze biological data. Having access to a teaching specific bioinformatics server will increase the quality of the education by allowing instructors to move beyond the lectures and provide students with authentic class exercises and projects. This includes teaching students about working on remote servers, developing basic command-line skills, accessing public databases and applying scripting languages (e.g. bash, R, python) to test biological questions. You will help students conduct projects that focus on analyzing large publicly available datasets. Current research standards in biology require all published next-generation sequence datasets be deposited in open source databases such as NCBI. Datasets from NCBI are ideal for student research projects because this database spans 10,000s of species and 3.9 petabytes of sequence data, which makes identifying datasets that meet the scope of research projects very tractable. In addition, data generation can be time consuming and beyond the budget of most classes. Together these opportunities will make students competitive in a technology driven job market because these systems are commonly used in academic research labs, clinical labs and the biotechnology industry. 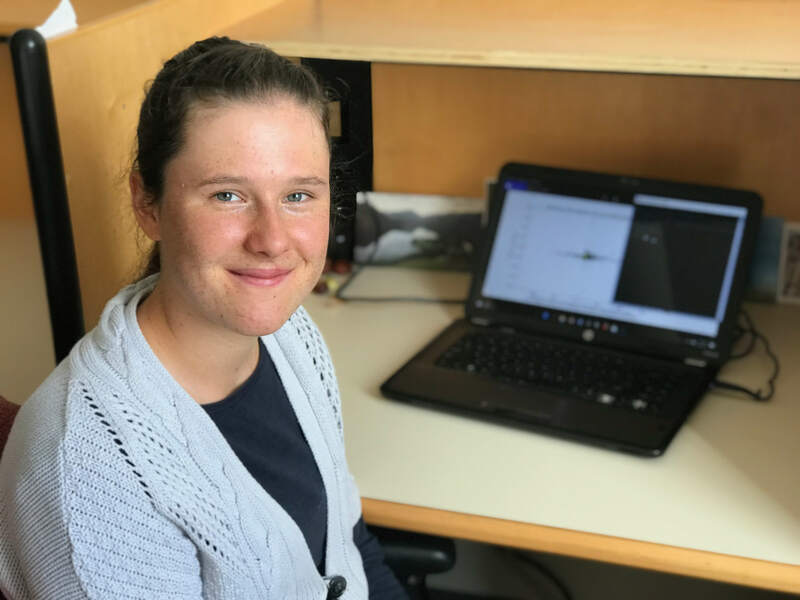 Recent Biology-Mathematics BS graduate and current Biology MS student Anastacia Wienecke uses large-scale genomic data and computational approaches to study why different individuals in a population make more or less protein in their cells. The basic structural unit of DNA and RNA. A region of DNA that initiates transcription of a gene. A segment of a DNA that will encode part of a protein. A region of DNA that encodes function. All the messenger RNA molecules expressed from the genes of an organism. The complete DNA sequence of an organism!